Check out Bahamas stay and play golf packages for great deals on golf and travel. Below is a list of golf resorts, golf packagers and golf courses offering golf packages for the traveling golfer. 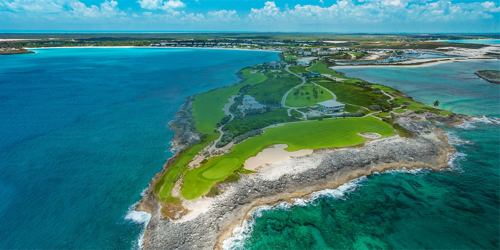 Located at the Bahamas' Leading Golf Resort, Greg Norman's award-winning golf course design at Sandals Emerald Bay preserves the landscape's pristine beauty and natural barriers. As the longest course in the Caribbean, winding through seaside dunes along a stunning peninsula, this 18-hole, par 72 championship course is consistently regarded as one of the best in the Caribbean by Travel + Leisure Golf. Sandals Emerald Bay Golf Course is the proud host of the Bahamas Great Exuma Classic, a PGA TOUR-sanctioned Web.com Tour event. For more information call 844-294-1583.